Planning an entire trip around a new coaster months before its scheduled opening is always a risk, as construction delays can and do occur. 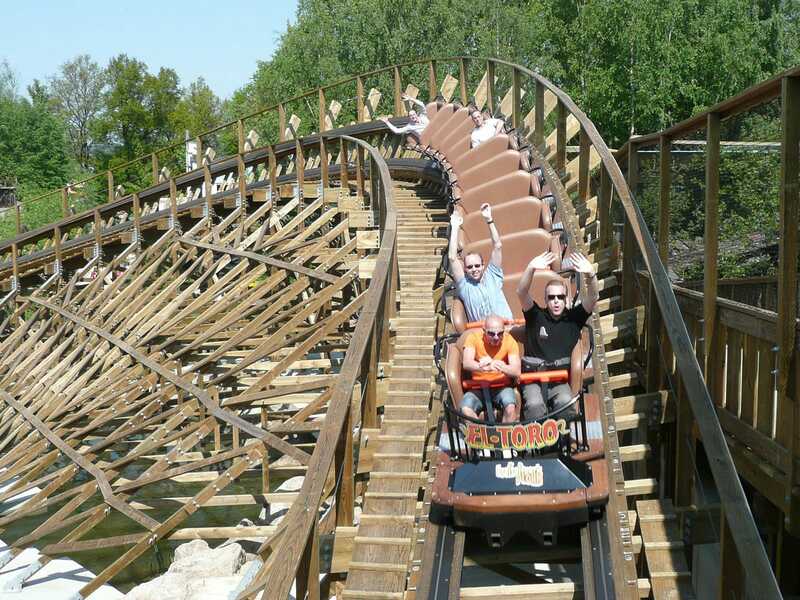 Fortunately there were no such problems with El Toro (#1337), the third wooden coaster to be built in Europe by the team at Great Coasters. The new ride is a mid sized attraction topping out at ninety feet, making it marginally smaller than the recent competition. Despite its diminutive statistics however it manages a relentless sense of speed that is maintained all the way through to the final brake run. Over the course of the morning I tried front seat, back seat, and various locations in the middle of the train, and as I type this I'm still undecided as to my favourite location. The most intense rides could be found in the middle seats, but the front had many things going for it too. One of the nicest design features is the way the layout is intertwined with an existing log flume, providing great visuals for both sets of passengers. The ride is also surrounded by photo points, chief the best of which is a wooden tower giving a birds eye view of the first drop. As it is, the ride gets my vote for the best wooden coaster in Germany by a huge margin, and it's well up there among the top few in Europe. Enthusiasts who have the opportunity to visit really should make the effort to visit; it's well worth it. The other coasters in the park are somewhat more mundane. The Silver Mine (#1338) was noteworthy only as the second Zierer Flitzer in twenty four hours. The third and final credit is Raupe (#1339), which we believe may be the only permanent Big Apple coaster in all of Germany, an exclusive ride if you will. Can anyone point out another one? The only other ride we tried was the Wildwasserbahn, our main aim being to look for potential photo angles for the coasters. As luck would have it my boat passed the main drop right as a boat containing Martin and Kat went over the top, providing a very lucky photo. The two permanent roller coasters in the Czech Republic can be found in Lunapark, buried within a large municipal park in central Prague. The more interesting of the two is a unique oval shaped family coaster that looks much like a bayernkurve. Roughly one fifth of the track on Jurassic Park (#1340) comprises a tyre drive system, with the ridiculously long train covering the remainder of the course by gravity. The only other credit is Horska Draha (#1341), a vintage Galaxi which rides pretty well despite looking every one of it's thirty six years. Outside of holiday periods there are no other attractions of significance in the park. Total time spent? Twenty minutes!